How does my ADHD medication work? Ritalin® (Methylphenidate) is probably the most common drug for the treatment of ADHD (attention-deficit hyperactivity disorder). 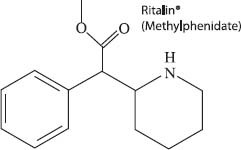 Ritalin® is a stimulant, increasing the levels of dopamine in your brain. Your brain normally releases dopamine to communicate feelings of pleasure and to increase the rate at which your neurons fire, which is supposed to help you focus.